Blog looking at a LADA diagnosis later in life from a partner's perspective. Tear jerking description of a woman's journey through her husband's diagnosis of LADA, slow to start but worth the read. Might be useful for partners or parents of T1Ds or even T1Ds who would like an insight into what it is like for loved ones when thier relative gets a diagnosis of type one. How sometimes best intentions might be misconstrued. 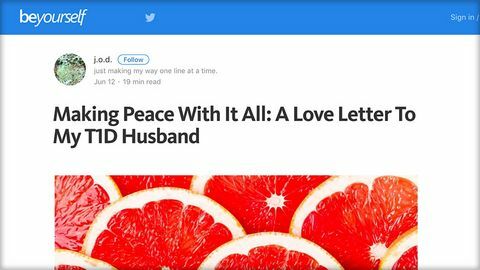 Beautiful and honest blog written by a woman whose husband was diagnosed with type 1 in adulthood after they were married. Many of the emotions expressed will be different to those experienced by spouses or partners who have never known a time when their partner did not have type 1, but there are many common feelings. Very helpful in understanding feelings ranging from type 1 being "the third person in our marriage" to "recognition that he often shields me from his own feelings about what this all means for him because he's trying to protect me - but who's been protecting him during all of that?" Not a blog providing answers but valuable in recognising such feelings exist for many.